Level 4 Girls Take 1st Place at WCGC…. & Level 5’s Take 3rd!!! Last weekend the MWT Compulsory Girls competed at the WCGC Country Classic and hit a Team Personal Best scoring a 114.35. 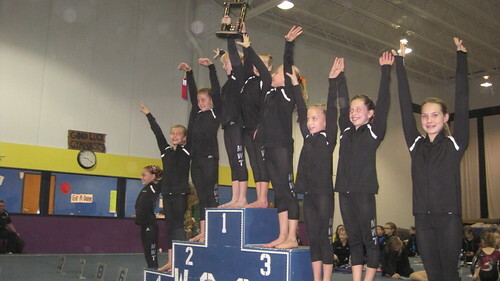 Not only did the Level 4’s take home the 1st Place Trophy, we had 5 Gymnasts take home 1st AA in their age group. Here are the podium finishers for Level 4. Previous PostCompulsory Girls Compete at Lafleurs Sweetheart InviteNext PostMade the big time…on the wall at Culver’s in HL.